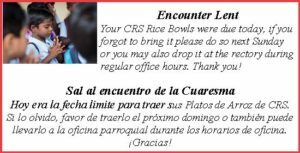 Catholic Charities Chicago Southwest Region Office provides the following services within the Office. INFORMATION AND REFERRAL SERVICES provide assistance to persons in need, sharing resources and referrals both within Catholic Charities and the community at large. For more information, please contact 772-349-8838. PUBLIC BENEFITS SCREENING — Supplemental Nutritional Assistance Program – (SNAP) Catholic Charities/SNAP outreach and enrollment program offers free screenings to verify eligibility for SNAP and applications assistance every Thursday from 9:00 a.m. – 3:30 p.m. No appointment is necessary; walk-ins welcome. For additional information, please call 312-217-7590. CHILDREN’S CLOTHING CLOSET is a volunteer service offering free clothing for children, age’s newborn to seven years old. For additional information, please call 773-349-8838. COMMUNITY CASEWORK AND COUNSELING SERVICES provide professional problem-solving, case-management and counseling services to families and individuals who are overwhelmed by problems that may include family Violence, sexual abuse, homelessness, grieving, coping with a disability or medical illness, parent-child issues, or marriage difficulties. For additional more information, please contact 312-655-7725. Or for Parish pastors only 312-655-7106. MATERNITY AND ADOPTION SERVICES provide counseling for the pregnant woman, birth fathers, and their families to assist in planning for themselves and their babies. Services include arranging for prenatal care and delivery and providing temporary care of infants in licensed homes for a short period of time while a permanent plan is made for the child. If adoption is the plan of choice by both parents, they are encouraged to actively participate in the selection of an adoptive family For additional information please call 1-800-CARE-002 or 312-454-1717. CATHOLIC CHARITIES LEGAL ASSISTANCE SERVICES: Attorneys offer free basic legal advice and referral services via a telephone hotline and in-person. For additional information, please call 312-948-6821. LOSS (Loving Outreach to Survivors of Suicide) provides services for those who are grieving a death by suicide of a family member or close friend. Group, individual and family counseling is available. For additional information, please call (312) 655-7283. SUMMER LUNCH FOOD PROGRAM provides free, nutritious meals to children throughout the summer month when school is not in session. For additional information, please call 773-349—8838. SENIOR SERVICES CASE MANAGEMENT – Satellite site providing case management to older adults connected with managed care organizations. CASA CATALINA BASIC NEEDS CENTER – provides food, clothing, and additional basic need services and referrals to community residents living in the Back of the Yards and McKinley Park communities. For more information please call 312-376-9425. YOUTH AND FAMILY THERAPEUTIC SERVICES – professional counseling services for children, youth and families experiencing a wide range of social, emotional, behavioral, education, mental health or family problems. For more information, contact 312-655-7191. CASIMIR – Catholic Charities administrative site that also offers a variety of services. For more information 312-655-7100. 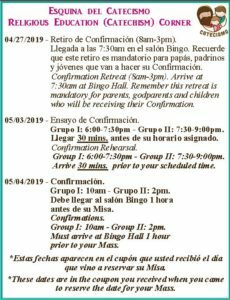 Every Wednesday, from 10:00 – 12:00 p.m.
PODER ESL classes every Monday and Tuesday from 6:30 – 9:00 p.m.
Senior Guild Meeting quarterly from September to June the second Tuesday of the month from 9:30 – 1:00 p.m.
• Información Central y Servicios de Referencias proporciona asistencia a personas en necesidad, compartiendo recursos y referencias para servicios dentro de Caridades Católicas y en la comunidad en general. Para más información, por favor llame al (773) 349-8838. • Verificación de Elegibilidad para Recibir Beneficios Públicos el Programa Suplementario de Asistencia Nutricional ofrece evaluaciones gratuitas para verificar elegibilidad para SNAP y asistencia llenando solicitudes cada jueves de 9 a.m. – 3:30 p.m. No es necesario hacer una cita. Para más información, llame al (312) 217-7590.
ropa gratuita para niños desde recién nacidos hasta los siete años de edad. información, llame al (773) 349-8838.
o dificultades matrimoniales. Para más información, llame al (312) 655-7106.
p.m. Para más información, llame al (312) 655-7098.
persona. Para más información, llame al (312) 948-6821.
disponibles. Para más información, llame al (312) 655-7283.
con Blue Cross/Blue Shield Managed Care.